Today, while a bit chilly, was so nice that I wanted to go somewhere. We've had a rough couple of days around here and I thought we were in need of a field trip. Alec's latest obsession with Lesser Pandas made me think of Roger Williams Park Zoo. I've been promising him I'd take him there for a while and decided it was the perfect time. 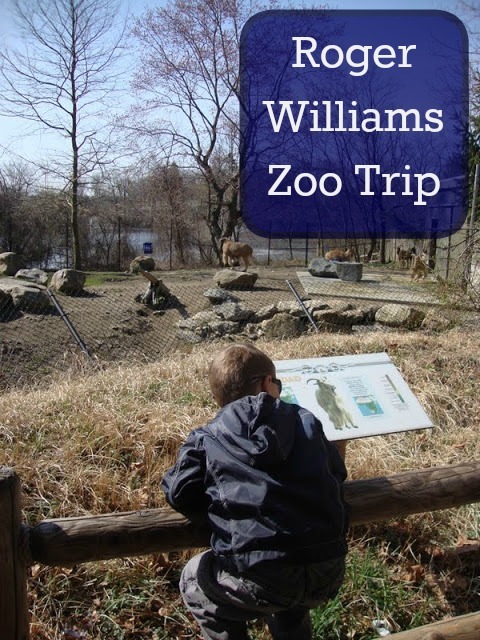 The boys were so excited to see different animals like giant anteaters, lesser pandas, American bison, green tree boa, red crowned crane, elephants, penguins, harbor seals, red wolf, and African wild dogs to name a few. We acted out different animals as we walked through the park and read all the signs. They got to try and jump as far as a snow leopard (50 feet!) but we only made it as far as a flea or bunny (4-6 feet). We watched a video of a baby giraffe being born and saw an elephant skull up close in the elephant/ giraffe enclosure. The boys were very excited to hear that the zoo now has a Binturong too! The two younger boys brought their cameras and really worked on learning how to take pictures; focusing, zooming, using a flash, etc. Ian was getting very annoyed with Alec when he couldn't get just the right shot of certain animals and we had to stand there for minutes upon minutes. They read maps, checked out the new playground and tree house. We looked at all the different insects found inside the playhouse too. The river otter is yawning; not hissing. The boys loved him (or her?)! The tree house! An awesome new play area for kids. They're just so adorable; what's not to love, right? What great memories you've now got - and I can't believe all the pictures you took - amazing. It's great how they try to make it as educational as possible. LOL! I don't even think I shared ALL the ones I took. I love taking photos. We love lesser pandas! My middle son even had me make him a lesser panda costume for Halloween one year. We were surprised at how many animals were still out and about; it was a fun day and we practically had the whole place to ourselves! We first heard of the binturong at our local zoo (a different and smaller zoo than this one) when they had a baby one for a bit. My boys had actually been able to pet it and talked at length to the zookeepers about this unusual species. They are really neat. We love finding new species to learn about. I wish we had a zoo near us. This one looks great! You are such a good mom/teacher to pick up the school day and move it outdoors when the kids seem to be struggling. I need to do more of that. I don't do that nearly as often now that they are in middle school and high school but I used to do it just about anytime any one of us was in tears or frustrated and I don't regret it at all. We learned so much (sure different stuff than I had planned) but still learning!